WASHINGTON — Washington Republicans are tightening pressure on Alabama’s GOP to keep a defiant Roy Moore from being elected to the Senate next month. Many are voicing hope that President Donald Trump could use his clout to resolve a problem that Republicans say leaves them with no easy options. Senate Majority Leader Mitch McConnell, in all-out political warfare with Moore, said there’d be conversations about the anti-establishment firebrand now that Trump has returned from Asia. He said he’d already spoken about Moore to the president, Vice President Mike Pence and White House chief of staff John Kelly. READ MORE: Can Republicans keep Roy Moore out of Congress? 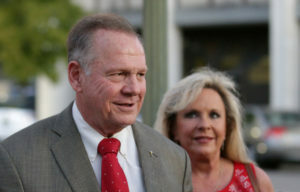 At the “God Save America” Conference later Tuesday in Jackson, Alabama, Moore said there is a “spiritual battle” going on in American politics. Twice removed from his post as state Supreme Court chief Justice, Moore’s candidacy in the Dec. 12 special election confronts Republicans with two damaging potential outcomes. A victory saddles GOP senators with a colleague accused of abusing and harassing teen-agers, a troubling liability heading into next year’s congressional elections, while an upset victory by Democrat Doug Jones would slice the already narrow GOP Senate majority to an unwieldy 51-49. Two Washington Republicans, speaking on condition of anonymity to describe private conversations, said they didn’t know what Trump would do, but said the White House shares McConnell’s concerns about Moore. While few think Trump could persuade Moore to step aside, several are hoping he can convince the Alabama state party to take some action. Despite the building pressure from national Republicans, state GOP officeholders have taken a measured response. It’s already too late to remove his name from the ballot. That leaves the state party with limited options. The 21-member party steering committee could vote to revoke Moore’s GOP nomination and ask election officials to ignore ballots cast for him Election Day, but that would risk a lawsuit and backlash from Moore supporters. The party has little interest in alienating Moore’s followers a year before elections in which the governor’s office and entire state legislature will be in play, but it remains possible. In an interview, Moore campaign chairman Bill Armistead said he’d seen no indication the state party will “back off in any way.” He said some in the party want it to pass a resolution embracing Moore. A spokesman for GOP Gov. Kay Ivey reiterated that she would not postpone the election to give Moore’s opponents more time to organize. That would spark a legal challenge, but a possible delay remains an option, Republicans say. Also possible is a write-in campaign, but national and Alabama Republicans consider that a longshot to succeed. Alabama Secretary of State John Merrill said no write-in candidate has ever won a statewide election in the state. McConnell praised Sessions Tuesday as a possible contender who is “totally well-known and is extremely popular in Alabama,” but conceded Sessions might not run. Sessions held the Senate seat before joining Trump’s administration this year. Some Republicans said they believe Sessions is reluctant to run but expressed hope that Trump — who’s soured on him after he appointed a special prosecutor to investigate Trump’s 2016 campaign’s ties to Russia — might urge him to enter the race. Republicans think GOP Sen. Luther Strange, whom Moore defeated in a September party primary, would have little chance against Moore. Strange has called such a move unlikely. If Moore is elected, top Senate Republicans already are threatening to vote to expel him as soon as he’s elected. That risks leaving the seat unfilled for a period of time. Chandler reported from Montgomery, Alabama. AP reporters Andrew Taylor and Matthew Daly in Washington and Steve Peoples in Birmingham, Alabama, contributed to this report.